Resume is the first stage of the employer's acquaintance with you. It'll make or break your interviewer's first impression of you. 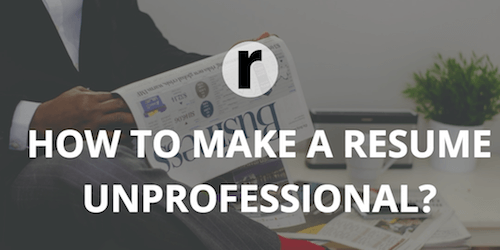 The Resumance Team shares 7 ways on how to spoil this impression and prevent it. Spelling and punctuation mistakes are caused by inattention. Needless to say, it looks very unprofessional. Read your resume several times, use text verification programs, give it to your friends, or rather do all of the above. Creating a new email address is completely free. Don't use personal mail for work and correspondence with the employer. It's best to use your name, surname or initials. There are many services for registering e-mail, so you can choose one where the desired name is available. Your resume should be pleasant in appearance, convenient for reading and perception. Don't state the information chaotically, everything should be well structured. Use numbered and bulleted lists, headings. This will show your accuracy and attention to detail. Photo in a swimsuit at sea won't be the best choice, unless you are a model for demonstrating swimwear. The photo in the resume should correspond to the expected post or simply look neat and friendly. Don't use abbreviations in the summary. This may indicate your laziness, and if you're lazy when writing a resume, then what to expect at work? List all your skills and achievements. Don't use the phrase "the same as in the previous paragraph", "look above" and the like. If you had similar duties at several previous places of work, try to rephrase or combine them. For each item, specify individual achievements and successes. Don't give contact information that's no longer relevant. Make sure that the phone of your former work is available. Thus, before posting a resume for a job, make sure that all contact information is up-to-date. That's all. We wish you to make as few mistakes as possible.